The last time my Uncle Tom saw his father before he died, he was at the stove. Grandpa (my Jiddo who did not want to be called Jiddo, but rather the all-American Grandpa) was in his mid-80’s, and he had something important to tell his physician son, so he sent for him at the hospital where Tom was making his rounds. Tom rushed off the job, a little miffed at what could be so important. When he arrived, Grandpa was working quietly at the stove melting chocolate. I wanted to be sure you know how this is done, he told Tom, and proceeded to demonstrate the proper technique for tempering chocolate for dipping. I heard this and a treasure-trove of other stories not long ago, when my mother and her brothers and sisters got together back in Ohio. It was a little reunion, a moment to hug each other, and for them to feast on memories that only they can share. 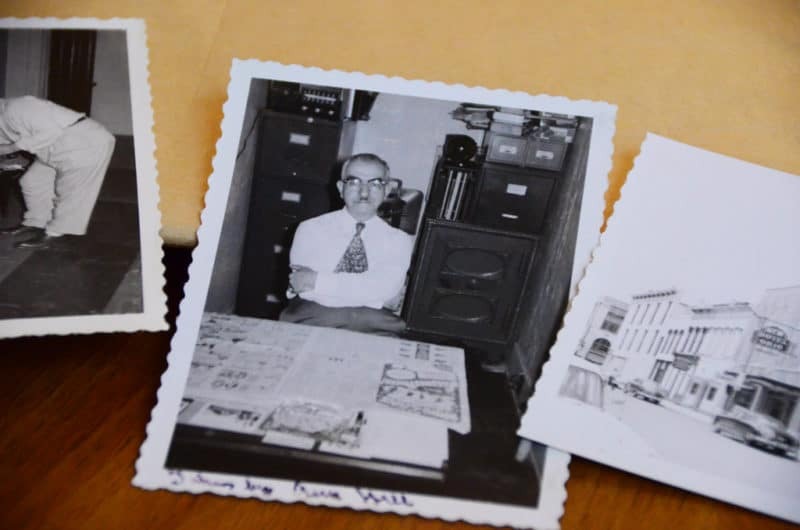 Uncle Tom is a historian of the highest order of his father’s life, going deep into the psyche and story of a man he adored. Uncle held forth at the siblings’ reunion, showing photos and documents of the life of his parents, tidbits that begged for more time to get every last detail. The sisters, my mother the youngest of them, sat on the couch with their rose corsages made for the Abowd siblings by cousin Anne to honor the day. 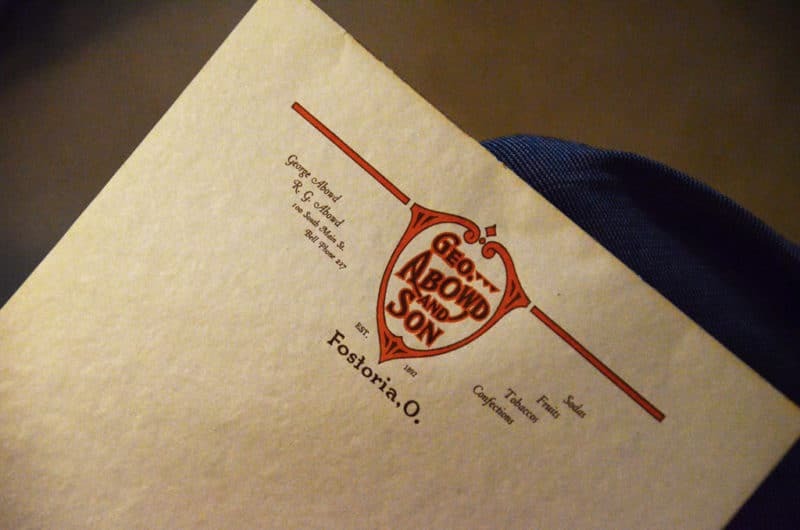 They passed to each other old photos, one after the other of the family, and even pieces of stationery, incredible to have been saved by a loving son all these years, letterhead from my grandfather’s candy store. 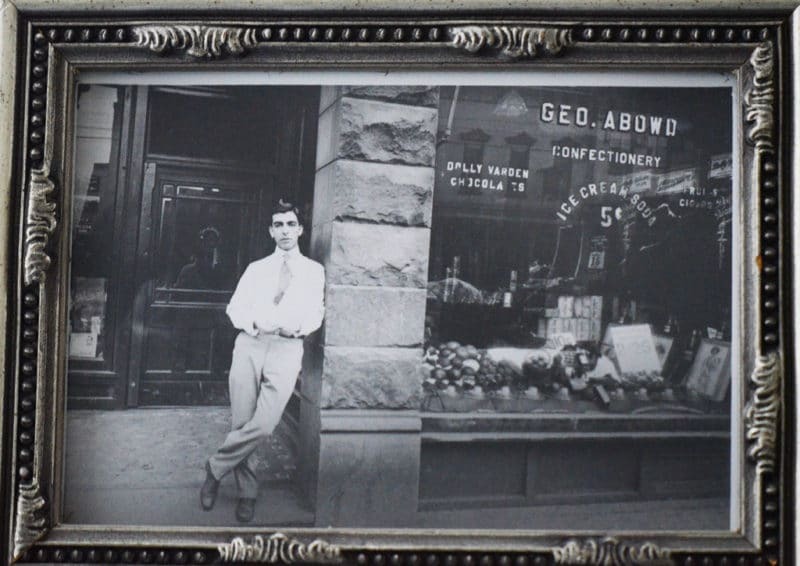 My grandfather, Richard George Abowd, became a confectioner as a teenage boy. I imagine he wasn’t much older than my nephew, his great-grandson and namesake. I use the old-school word “confectioner” whenever I can, and I take pride in telling people: My grandfather was a confectioner. Such a description lends a kind of stamp of approval to my own pursuits, and a heritage that speaks to authenticity. Confections were not, however, my grandfather’s idea of his destiny. He wanted to study, and he wanted to study law, at the University of Michigan. From the time he came to Michigan’s Upper Peninsula in 1896, a five-year-old on the arm of his mother (Afifa, herself just a teen girl, but a strong one, a tough one), he started preparing. He learned to read, write, and speak English in an Arabic-only household. He worked jobs to save money so that he could make his way to Minnesota, where he would start his high school college-prep program at St. Thomas Academy. Things were looking bright until the day, not long after he arrived in Minnesota, when he was called to the headmaster’s office. Young Richard’s parents were there, and they would be leaving immediately with their son. Their destination was Fostoria, Ohio, where a Lebanese friend was going to help my grandfather open a business to support the family, a candy store. Richard had the smarts and the language to make a better go of things than his parents had on the cold, harsh, rather untillable land they had tried to farm in the U.P. The shop window was emblazoned not with my grandfather’s name, but rather his own father’s name. My great-grandfather George would sit in his chair by the cash register and give the candies away to the little children who came in, much to Richard’s irritation after the work he put into making them, no doubt swiftly, for a profit. A Hershey chocolate salesman taught Grandpa to temper the chocolate, and about the sorts of inclusions (nuts, marshmallows, dried fruit) that taste good chocolate-covered. When he married my grandmother Alice, Grandpa showed her how to temper chocolate, and my mom and uncle tell me she covered everything in sight with chocolate. It was a family affair. 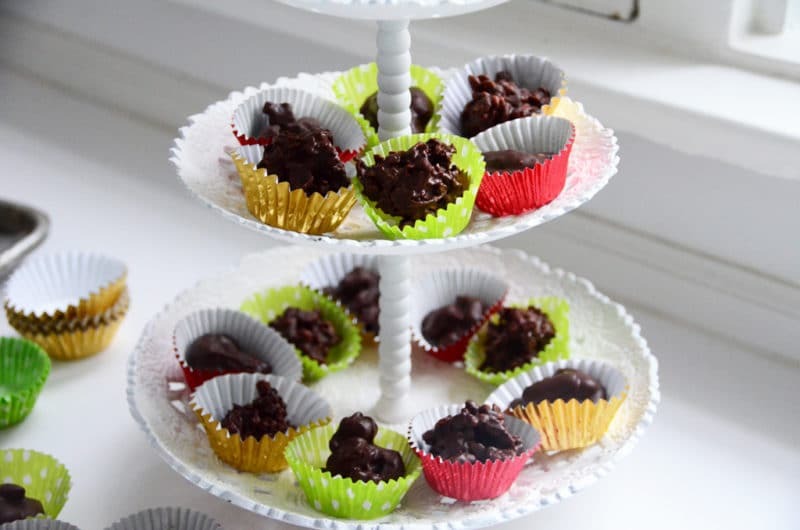 The children would help and carry the sheet pans of wet candies to the back stairs to cool and dry, just as I did as a child when my mother dipped chocolates every Christmas. I personally remember my grandmother’s pretzels, coated in white chocolate and resting on waxed paper to dry in the basement of their home on Maple Street. That was quite possibly my first taste of salty-sweet pleasure. I was five years old. My mom and Uncle Tom said they never saw their mother eat a bite of the candy, not one bite. She made it and made it and made some more, but the candy was boxed and given away or eaten by the family. The joy was in the doing. Once his candy shop became nicely established, Grandpa was “strongly encouraged” to hand the business off to his brother, who proceeded to run it into the ground while Grandpa moved on to something else that would support his own family (a hotel, The New Ohio Hotel). The University of Michigan became relegated to my grandfather’s unrequited dreams, one of those lifelong unmet ambitions that can drive a man to bitterness, or at least to drink. Instead, Richard gave his own seven children the educations he had wanted so badly for himself. They went on to give their own children—many, many of them—extraordinary educations that their father would be proud of. Meanwhile my grandfather was a self-educated man, reading several newspapers every day sitting at his desk at the hotel, and engaging in discussions about all manner of subjects with everyone who would talk, especially his loyal weekly Rotarians. Yet just before he died, Grandpa had something important on his mind. His thoughts no doubt ran to so many of his life events, and what could have, should have, would have happened, if only…. But his mind also went to what did happen, the perfected techniques of dipping chocolates, a confectioner’s heritage worth passing on. 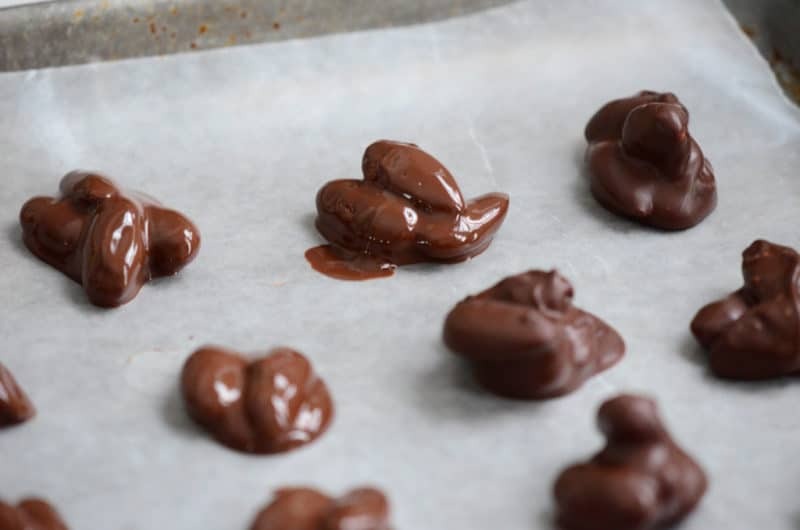 Choose high quality chocolate—Callebaut, Sharffenberger, Green & Black’s, or even a big organic bar from Trader Joe’s—and avoid regular chocolate chips; they don’t melt well. 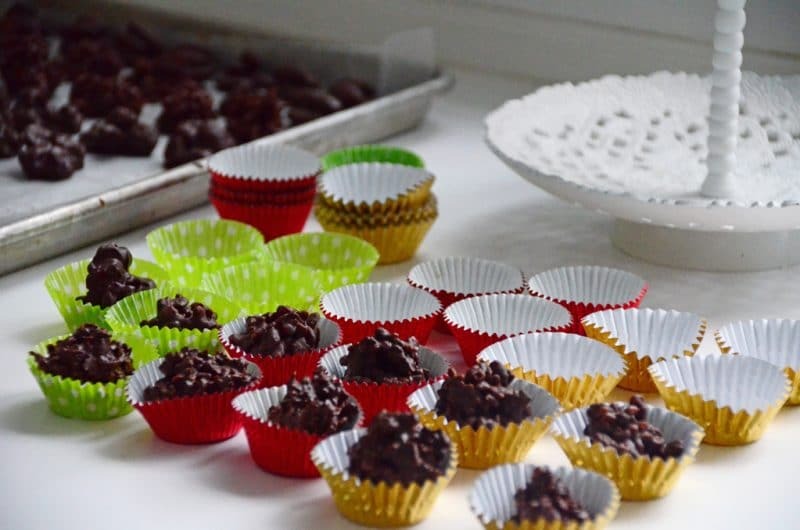 Choose all sorts of inclusions for dipping; I usually pick three or four to do in one candy-making session, about a cup of each in their own small bowls. Be sure to have everything ready for dipping before tempering the chocolate, so that you can work swiftly once the chocolate is ready. Make as much or as little chocolate as you like, though the more you use, the easier it is to keep the chocolate tempered while you work. The quantity of candies in the end depends on the size of your drops and your inclusions, but a pound of chocolate yields about 3 dozen 1-inch candies. Line two sheet pans with waxed paper. Place the nuts and other inclusions each in their own small bowl for dipping, each with their own teaspoon for dipping. Temper the chocolate. 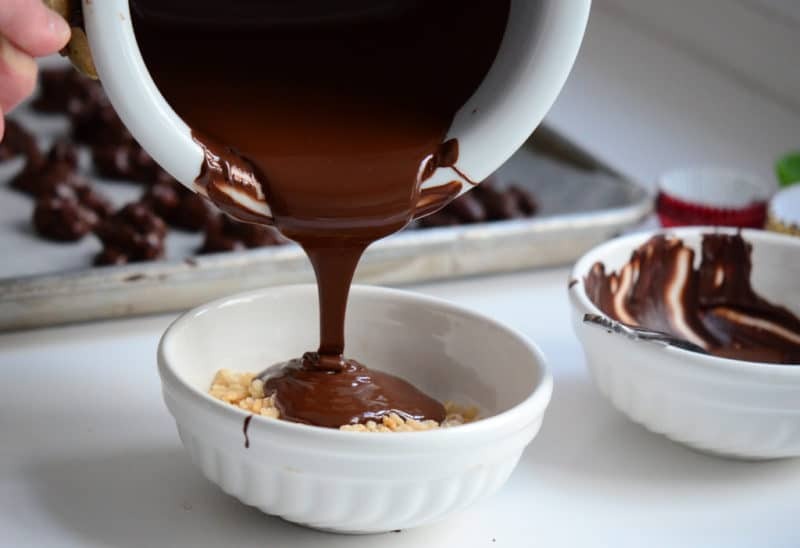 Do this by melting the chocolate gently either in the microwave (15-second increments, stir between) or over a barely simmering double boiler, very slowly, to 110 degrees. Cool down by seeding the melted chocolate with more finely chopped chocolate and stirring frequently until it reaches 84 degrees (use less seeding as the chocolate gets into the 80’s, or the seed won’t melt well). Warm back up very gently to 89-91 degrees and keep the chocolate at that temperature for dipping. Work swiftly to keep the chocolate tempered, at 88-91 degrees throughout this process. Pour about a cup of chocolate over the nuts or other inclusions in one of the small bowls set up earlier. Stir until coated. 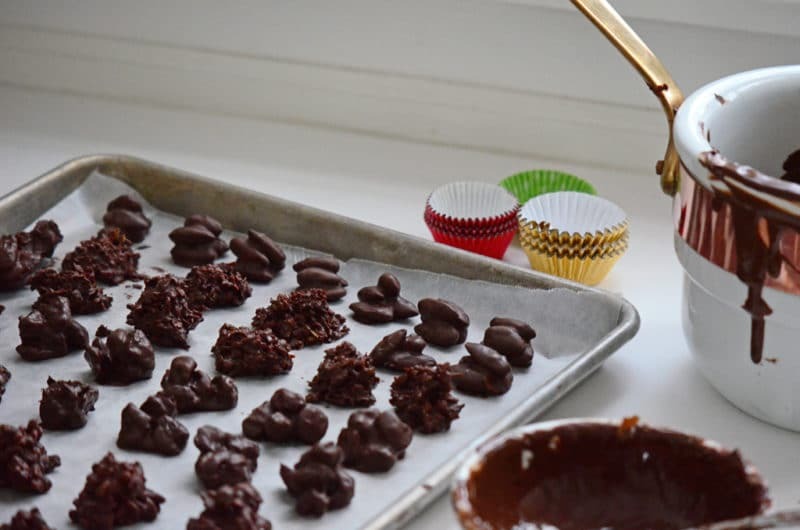 Using a teaspoon, drop a small quantity (4-5 almonds, for example) onto the waxed paper, arranging the nuts on top of one another to form the piece of candy. Repeat until all of the inclusion is dipped. Repeat this process for each bowl of inclusions, dipping one bowl of inclusions at a time before pouring chocolate into the next bowl. The chocolate may cool too much and go out of temper (it thickens). Place it back on the double boiler or in the microwave at five-second intervals to bring it back to temperature (88-91 degrees) and continue working. 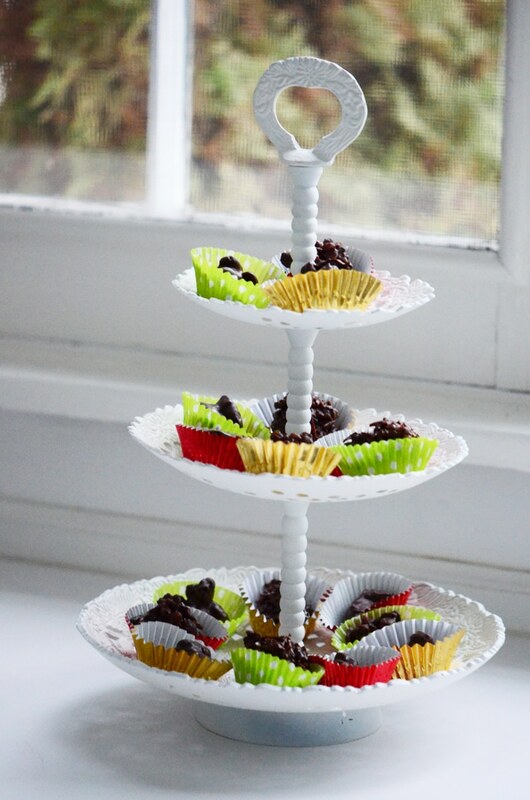 Place the sheet pans of candies in a cool, dry spot to set up and harden. Box for gifts, or place in little paper cups on a platter or tiered plate stand to serve, extra special. 19 Responses to "Chocolate-Dipped Candies, and Geo. Abowd & Son, Confectioners"
Wow! This is the best thing I have read in a long time (and I read A LOT)–and no pun intended, very sweet. It gives you a real sense of perspective when you are fortunate enough to know your family history this way–well done, Maureen! Beautiful photos, beautiful chocolates, and a beautiful family. You are lucky, indeed, my dear friend. No matter how hard we think we have it, nearly every one of us has someone in their past whose hard work and hungry sacrifices resulted in a better, fuller life for us . This is the type of American story that makes me proud. Very touching post. I was moved. Reminded me of the Robert Solé novels. Cool to 84 by letting it sit or “seeding”. Warm up again to 89-90. If it cools too much (thickens) warm to 89 again. Test with wax paper dipped in, should harden in 1 or 2 minutes. Keep at 89-80, pour over inclusions, mix and spoon drop, arrange small clusters on wax paper. As a child my dad ran a grocery store and sold ice cream as an aside. Up the street the “Sweet Shop” made their own ice cream, candies and sold a few grocery items. Dad and the Sweet Shop owner agreed that dad would not sell ice cream and they would not sell groceries. This lasted many years, they even came to dad’s store to buy bananas for the banana splits. The bananas were hung on a chain, the whole stalk, one had to use a curved knife to cut loose each bunch. I used to watch them dip chocolates and was too bashful to ask for one, they had to tell me to take one. The Sweet Shop to this day is run by the original owner’s relatives (north side, La Crosse, Wisconsin). Dad’s small store was eventually sold and became an antique shop then coin shop, etc., we used to live behind the store when dad owned it. Also behind the store there is the largest grape vine you can imagine. The new owners tried to get rid of it but it is too healthy. One time I picked a leaf that measured around 8 inches across as a joke for my sister’s birthday, she framed it and still has it. Very touching and interesting story. I am very pleased to read about your Mom’s family, since I only really know about your Dad’s. I loved the story….not to say I didn’t love the chocolates. Thank you for going back in time for the holidays. A lovely story, Maureen, and well told. Much love to you and your family for the holidays. Oh to be a fly on the wall at the gathering of the Abowd siblings! I miss them all. Grandma’s chocolates were the BEST! And she always managed to have plenty no matter how large the crowd got. A beautiful presentation of Grandpa’s story, Maureen! The photo of a young Grandpa in front of the confectionery and that fabulous stationery are truly two of my favorite things. I know that siblings meeting meant so much to my dad. What a beutiful story and memories, the recipe to. What a wonderful story! It reminded me of so many Lebanese immigrants who had a similar path; of Ralph Nader’s family, for one! Lovely story of two of the BEST things: family and chocolate! Thanks so much Kathleen–and how lucky we are to have Lebanese traditions passed on to us. You’ll find Lebanese recipes here on my blog (search under recipes in the top navigation and in the search field) and also in my book, Rose Water & Orange Blossoms! This is awesome! My interest is **alchohol** experimentation. Do i still wait for the 90 degree temp in tempering process to “dip” the alcohol even though it’s not really a nut, but a liquor? Can i just mix in the alcohol at the 110 degree stage? Great question–I haven’t dipped alcohol inclusions and don’t have the method to share! Let us know what you discover!